I cannot, for the life of me, get us approved for a VA home loan. It just amazes me. I became a United States Marine. I served two tours in Iraq. I earned two Bachelor’s degrees. I’m working on a Master’s degree. But I cannot obtain a home mortgage using a VA loan. My biggest obstacle right now is the fact the overwhelming majority of our income, supplied by the VA nonetheless, doesn’t count?! I know it’s ironic. VA supplied income doesn’t count towards a VA loan. The greater irony is that two forms of income are Basic Allowances for Housing as part of our Post-9/11 GI bill benefits. Yes, money intended for housing cannot be used to purchase a house for oneself. I can blow all that money on rent, but I cannot buy a house with it. It’s sad because it’s not a tiny amount of money either. One of these days I’ll write a post about why I’m comfortable talking money this casually with strangers, but it really can wait for another day. For the months of February, March, and April in the spring semester, my husband and I will accrue $2,922 a month in Post-9/11 housing allowances. We live in the Phoenix Valley and could rent a ridiculously oversized luxury rental home with all that money. It would be a waste, but that’s one way we could spend our money. In the eyes of our preferred lender, USAA, this money does not exist. I’m not bashing on USAA. They have their own policies to abide by and we’ve had great customer service in the past and throughout this frustrating process, but I’m disappointed. The explanation I received yesterday was we could stop attending school at any time and that form of income would dry up. (Today, I was also told that it’s the VA who makes this rule.) Really?! If I stopped going in to work, I’d lose my regular income, too. The lending industry makes no sense to me. As I’ve discussed this matter more privately with friends, stories come out of the woodwork that people they know, whose existence is solely dependent on their Post-9/11 housing allowance, are getting approved for home mortgages. Veterans who do not work but go to school full-time are privileged to use their housing allowance on their own homes and not paying someone else rent. The USAA representative I spoke to yesterday even confirmed it’s possible a local lender could approve us using this form of income. So, if a local lender can use this income, why can’t one of the biggest banks in the world? A bank that can absorb a little more risk than a smaller, local lender? I am a little angry about this issue because in the eyes of the lender, the $780 I pay in rent and the $750 I pay for daycare combined with the remaining amount of other debts we have leaves no room for a home purchase. The beautiful home I’ve had my eye on since October. 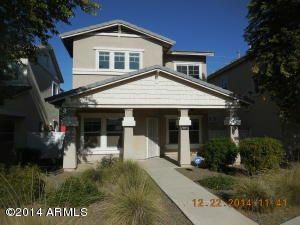 The home I want is a foreclosure and it’s unlikely I’ll find another in the neighborhood for quite some time. The listing agent dropped the price about $21,000 and I wrote him a heartfelt letter about my efforts to acquire the property. I asked him last night if he struggles to find a buyer would he would consider donating it to Homes on the Homefront. Honestly, I’m tired of investors picking up beautiful foreclosed properties, doing some basic repairs, and drastically hiking up prices that hurts local economies around the nation. The answer I got back was disappointing. The individual doesn’t own the property but is a broker for Freddie Mac. He did offer his services as a broker but clearly he missed the point that I’ve struggled to purchase a home because two-thirds of my family’s income comes in the form of non-qualifying funds. Thankfully, I know our rental situation won’t last forever. Even if we are not fortunate to own a home before my husband becomes a lawyer, we’ve established the guideline that less is more. We do not want to be a “house poor” family and it stuns me to see homes in the $600,000 range in Gilbert, our favorite Phoenix suburb. It is hard for us to justify spending anymore than $200,000 to $250,00 on a home but honestly our goal is to spend even less than that on a property. It is even harder for me to justify spending a large sum to purchase a home after reading the two books I mentioned previously. Housing has been so artificially inflated with the competition between dual-income earners that it’s no surprise the housing bubble burst as badly as it did. It might not be a bad idea for us to wait for it to burst again because the local industry here in Phoenix clearly didn’t learn its lesson. New home subdivisions are cropping up incredibly fast and I wouldn’t be surprised if five years from now a number of the owners just walk away from their properties again when the owners realize they can’t make their payments or might be underwater on their homes. If we brave a home purchase in 2015, it will require several things and I’m not sure it’s entirely still possible to get a loan once again since we lack that second “true” income. Unfortunately, the other obstacle we’ll encounter is the multitude of other families looking to purchase before the start of the new academic year, which is another reason this December home was a good “fit” for us. Stay tuned….some day we might be homeowners. If the VA allows it. 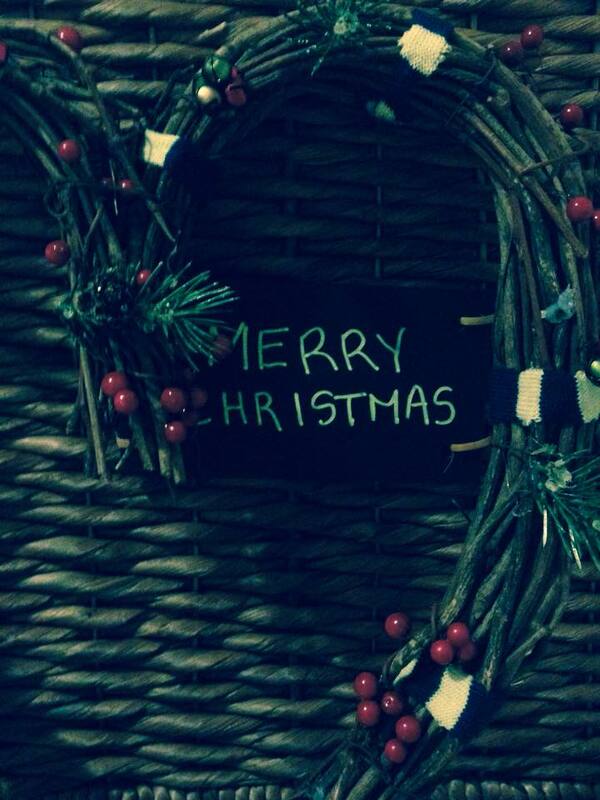 A belated Merry Christmas to you all. 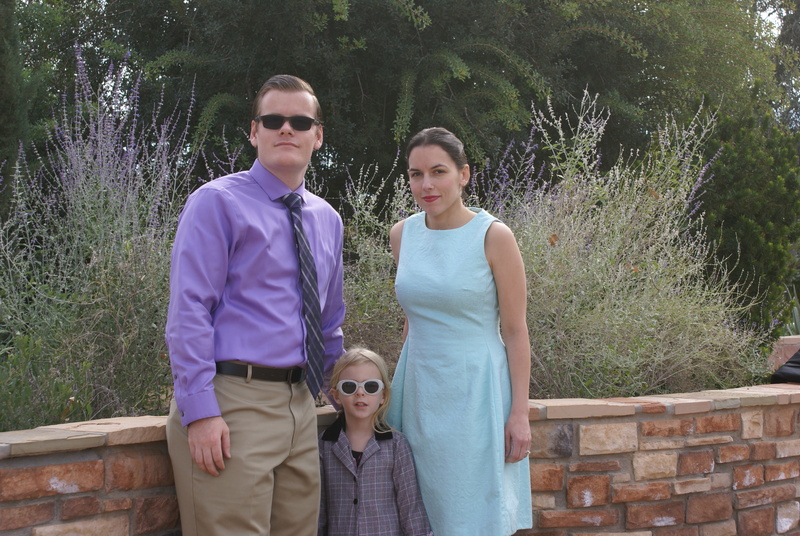 I spent yesterday with my family taking family photos. I only get a few opportunities like this a year. My husband does not care to have his photo taken and I learned this year, it seems like this trait comes from his grandmother. She didn’t care for a family photograph during our August visit to Wyoming. Avery enjoyed her gifts although she did complain about not receiving a remote controlled fairy from Santa Claus. 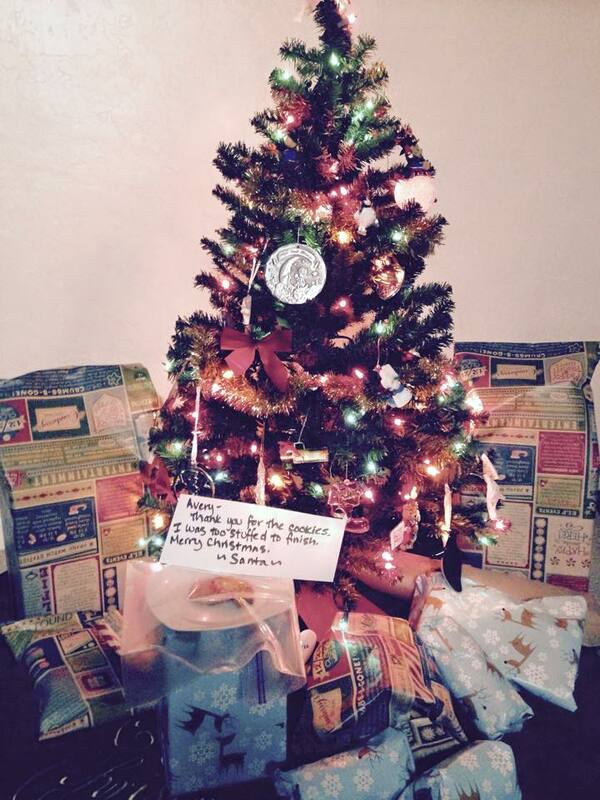 Note: She only mentioned her desire for this present on Sunday when we saw Santa at the San Tan mall. Four days is not enough time to acquire such a gift and as we’ve seen, there aren’t any remote controlled fairies. We did find a (potentially) suitable alternative but Christmas is over. We do not need to cave in to her 4-year-old desires. Unfortunately, she’s been really bratty lately. She won’t nap and it’s turned her into a foul little monster on a number of occasions. We did not put her on the Naughty list, but’s it’s been quite a temptation for me. I made a lamb bistilla yesterday for dinner; we had ham a few weeks back with my in-laws as they had plans to spend Christmas in Wyoming this year. 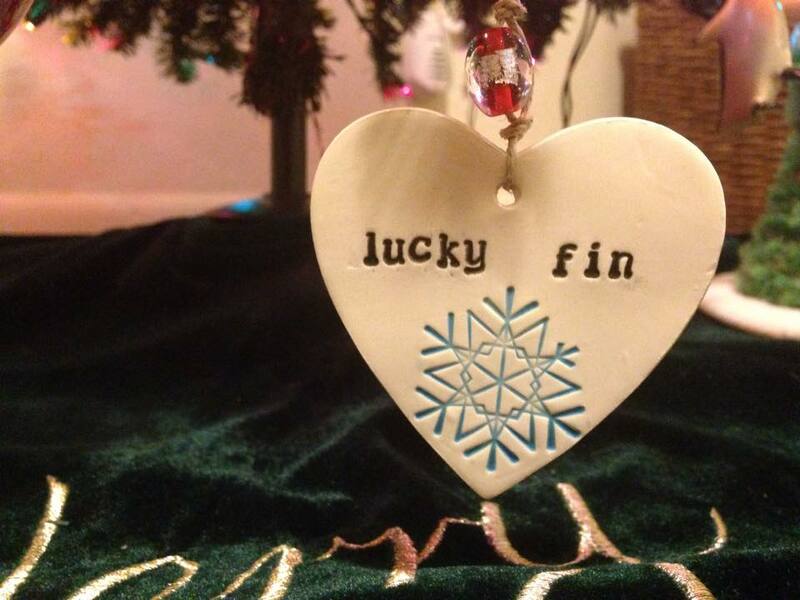 We bought Avery a Lucky Fin Project ornament for the first time. She was born with a limb difference and after I became aware of this organization, I’ve been eager to buy her something special to celebrate her difference. And it’s important to also share where I was 10 years ago for Christmas. 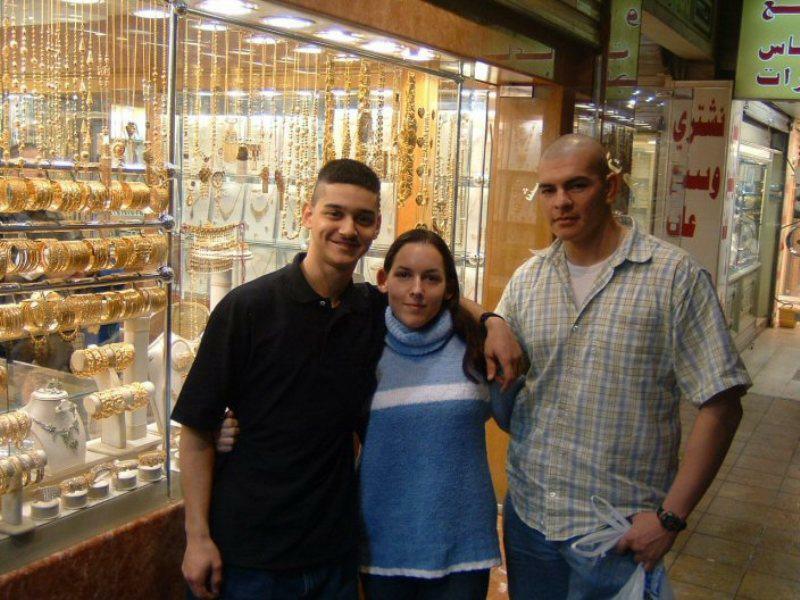 During my first deployment, I was privileged to take an R & R (Rest and Relaxation) trip to Qatar. In my case, the trip was during Christmas and I’ve included my journal entry from that time period. Merry Christmas everyone. I got my Myspace to keep working (for now anyways). I am pretty excited about that. I think I sent hellos out to everyone that would look at their accounts so I love and miss you all. Things are going well here. Kind of strange getting some time off to relax. Can’t begin to tell you how awkward it is to be walking around without a rifle. I feel naked. I also feel strange actually getting to wear civilian clothes. Right now I am actually in my Christmas attire. I have on a red long sleeve v-neckline blouse and jeans with a matching red choker. I only have sneakers so it’s not as dressy as I would like it to be. Took some photos, which I will try sending out once I leave this place. Yes, Leslie, this is what I was talking about. You will get to see me in cities, it’s what I was saying would be weird for you to see since I am here overseas. No it wasn’t some naked dudes or something like that, I am sure Jon would flip a gasket if they were. I also have a nice fluffy blue sweater for tomorrow, jeans, sneakers, like today and I get to go out on the town tomorrow to a mall!!! Every girl’s favorite pastime (maybe not, Laura I don’t know if you like shopping or not, you said you hate barbie doll females). I plan on taking as many photos as possible, which is kind of limited here because of the cultural atmosphere. They aren’t like Americans who snap photos like the crazy tourists we are and they also have a big thing with modesty, hence my two long sleeved shirts even thought it is probably high sixties maybe even low seventies. I don’t know. Will get back to you all later. I love and miss you all. Keep in touch. Look at all that pretty jewelry….I bought a Fulla doll instead. I’m happy to report my artwork, MOPP Ops, was selected for the Student Veterans of America Presents: Warpaint art competition. 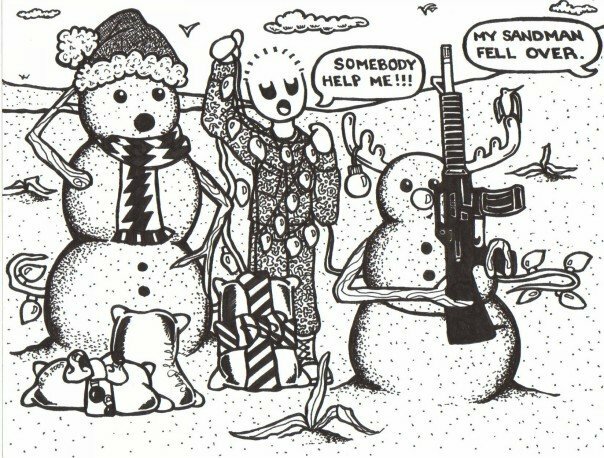 It is a piece I drew back in 2006; it is sarcastic without being offensive and playful in light of inconveniences service members face on deployments. To honor my service branch, I used a double mat to frame the drawing. It has a larger blue mat with an inner smaller red mat to mimic the blood stripe on the NCO and Officer dress blues uniform trousers. It will be shown at the National Conference in San Antonio from January 8-11th. I won’t be in attendance, but Joanna Sweatt, our Military Advocate at ASU, will be going. It’s such a great opportunity for her. Medal of Honor recipient Corporal Kyle Carpenter (USMC ret.) and Shoshana Johnson (Army), the first African American female Prisoner of War (POW), are among the panelists scheduled for this event. The top 40 pieces will later be unveiled in Washington D.C. The top three competitors will receive scholarships and financial assistance to attend the unveiling. I am putting the horse before the cart, but if I’m one of those three, I could use the scholarship money to help fund my t-shirt project. I also wanted to share some news about female veteran issues. 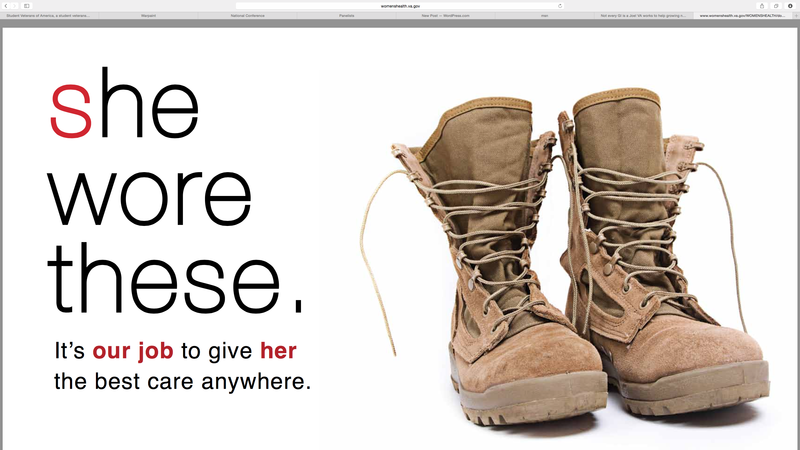 Awhile back, I noticed the VA had some female service awareness information on their site and this morning, I found an article written about this action. Is is silly that I absolutely love this one? 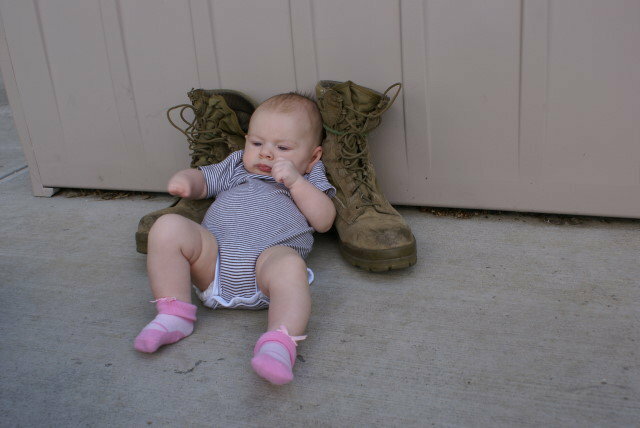 Back in 2010, I took photos of my daughter with my combat boots. A few of those photos are shown below. Most people make the assumption these are my husband’s boots. The world lost numerous promising young people yesterday. I know people die every single day; I am quite aware of the reality of accidents, injuries, chronic disease, and old age that play into these statistics. But yesterday, a large group of people were slaughtered, inside a school nonetheless. For my generation, school shootings/mass shootings/spree killings have become unfortunately common. I know this type of violence crosses my mind in December because of the December 14th 2012 school shooting at Sandy Hook Elementary School in Newton, Connecticut. The news media reflects on the loss of those children and the burden placed on their parents to move forward with their lives. Yesterday, this form of violence hit schoolchildren and their instructors in Pakistan. The news has stated the Taliban terrorists killed 141 people yesterday. The educators and children lost is a devastating blow to their respective communities, the global community, and most importantly, their families. 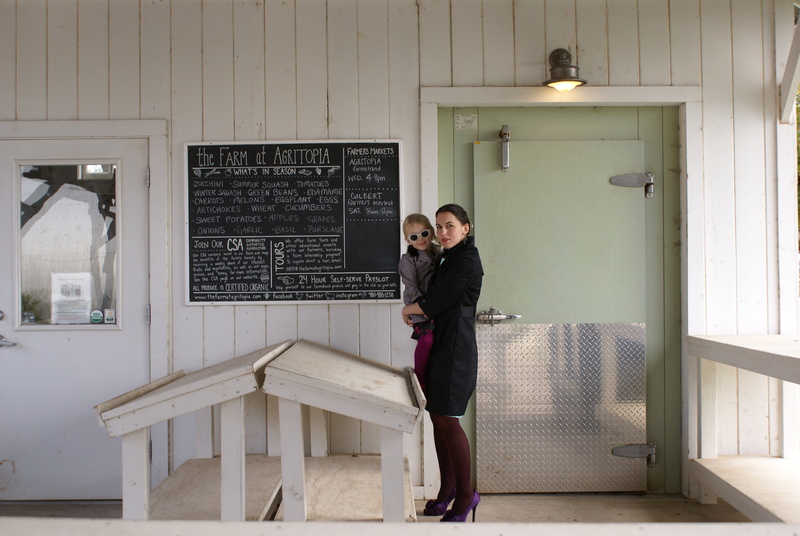 You should never be fearful of sending your kids to school, but that’s becoming a more frequent reality for families. While I was serving on my first deployment, a similar tragedy occurred in Beslan, Russia. The families of the victims of these tragedies, and other similar such tragedies, are bound in grief no one should experience. As a parent, my heart goes out to these parents and the loss of their children. My friend and coworker, Joanna Sweatt, sent me the link to the Student Veterans of America’s first national art competition and I’m here to spread the world. Let’s get Post-9/11 vets to send in their stuff!!! The first prize winner gets a paid trip to Washington D.C. and a $1,500 scholarship. While I am not debuting my chosen artwork for the competition, below are two of my other pieces that I really like. I loved to draw as a kid and frequently received different art supplies as a kid. However, I learned that illustration is by far my favorite form of artistic expression, especially pen and Sharpie (not kidding). It’s been awhile since I honed my skills but I am brushing up on them to create my t-shirt project. 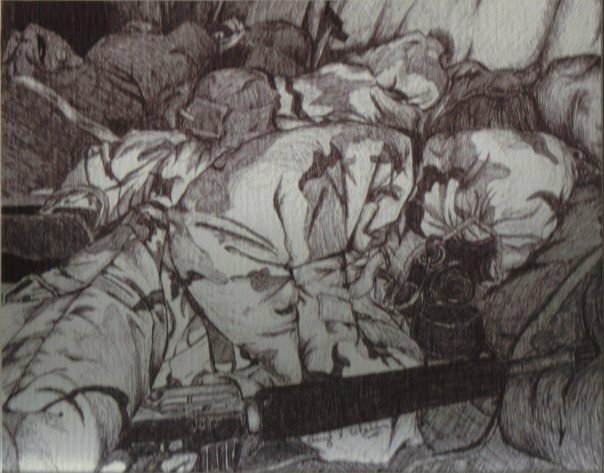 I drew this piece before my first deployment and it’s drawn from a 35mm photograph I took at MOS school. During one of my last classes, I surprised my professor, Dr. Kimberly Scott, and my peers with the fact my GI bill benefits are quite substantial. I don’t recall the exact discussion but I had made some reference to what my GI bill benefits pay for and like always, I tend to forgot that not everyone is aware of what benefits are available as a result of serving this country. As such, I added a widget on the front page of the blog to show the history of my own GI bill benefit payments. I served from July 2003 to July 2007, which entitled me to 36 months of the Chapter 30 Montgomery GI bill. As a student, I am paid that benefit (based on my enrollment) directly and then paid the institution of higher learning for my semester program expenses. I used this chapter of benefits at Palomar Community College, the University of Wyoming, and for a brief portion of this semester at Arizona State University. It was not until I moved to Wyoming that I found out I could also qualify for Pell Grants to use with my GI bill benefits. Originally, veteran students could not qualify use the Pell Grant in tandem with earned benefits. Now, it is also important to share that my benefits were further supplemented by two things. 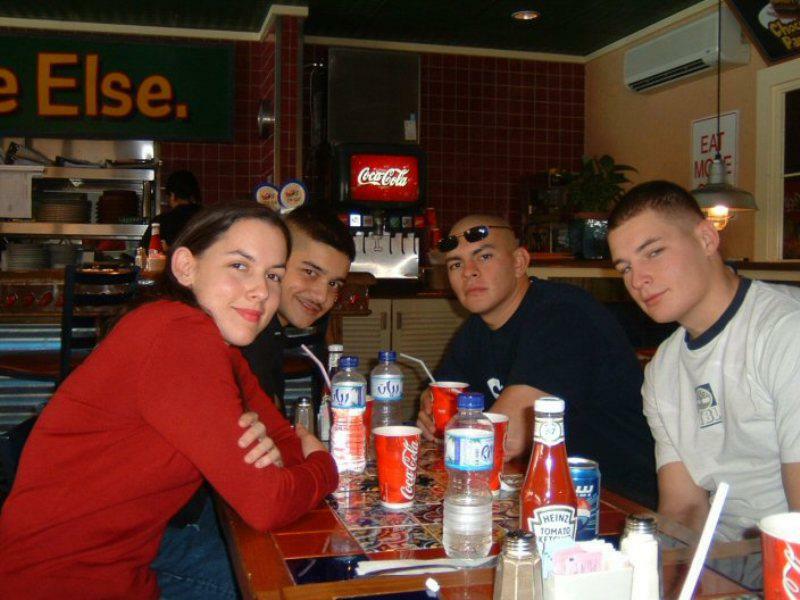 In 2003, when I met with the local Marine Corps recruiter, I was also offered the Marine Corps College Fund as an enlistment incentive (and one contract rank to Private First Class). This additional benefit, which added $3,000 to my educational benefits, was a privilege extended to me because I was coming in with college credits. The second benefit bump I received was by paying into the Buy-Up program. Individuals must make that decision while they are still actively serving. A service member can contribute up to $600 for Buy Up and in return receive up to an additional $5,400 tacked on to their Chapter 30 benefits. This additional cost was on top of the $1,200 I paid for the Montgomery GI bill. I also served during a time period where I was eligible for the Post-9/11 GI bill, which I did not have to pay into to receive. I had the opportunity to switch over to Post-/11 with my remaining months of Chapter 30. So, for example, if I used 3 months of my Chapter 30, I would have 33 months available to use under Post-911. My second option, as I actually did, involved continuing my Chapter 30 entitlement and after exhausting, receiving 12 months of the Post-9/11 GI bill. For me, the latter option made more sense. 48 months of combined benefits is a pretty nice reward for serving my country. Some of these options also provide educational assistance to dependents of service members. 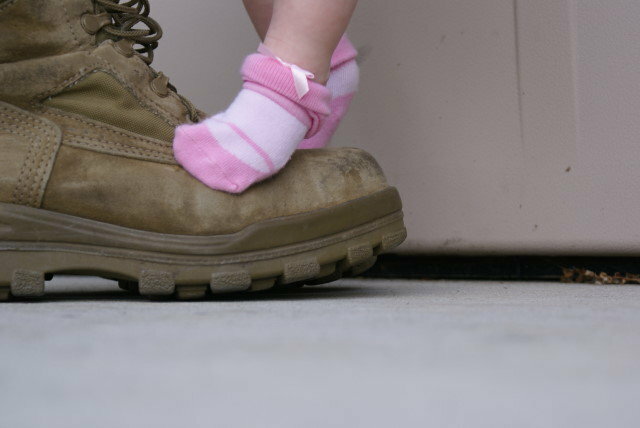 The Post-9/11 GI bill is unique in its transferability to dependents. The 33 Fry Scholarship is available to children (and soon to surviving spouses) of service members who died in the line of duty after September 10, 2001. Chapter 35 provides education benefits to dependents of service members who were killed while on active duty, died as a result of a service connected condition, or who are 100% totally and permanently disabled. My Post-9/11 GI bill is at the 100% level and is graduated for service members in increments of 40% to 100% based off of one’s service time. For me, that means I get tuition and fees covered 100% at the highest in-state rate, I receive a book stipend up to 24 credits an academic year (max amount is $1,000), and my BAH. For ASU, the rate is $1,461 for a full month of attendance when enrolled full time. 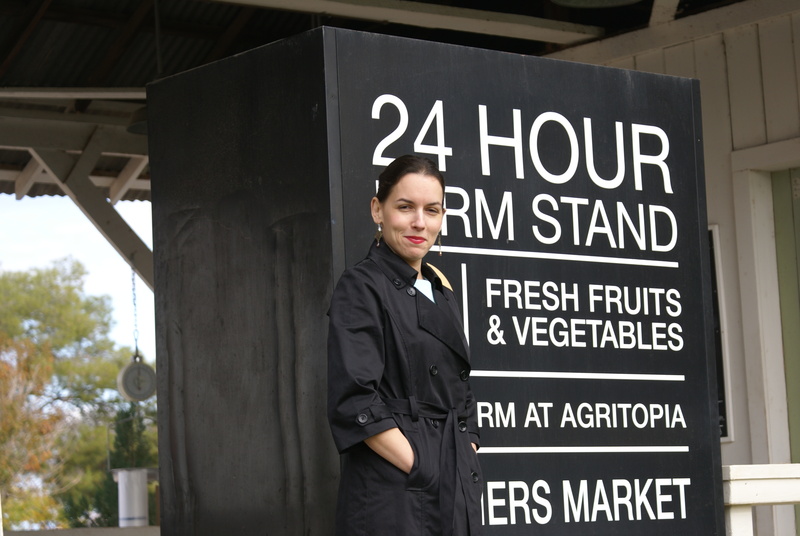 Fully online students only receive 1/2 the national average, $755 currently. As well, one must have a rate of pursuit in a session of 51% of higher to receive the BAH. Note: active duty students (or spouses of active duty members) do not receive a BAH because they have one already provided by the Department of Defense. This reason is also why some service members will conserve their Post-9/11 GI bill until after they get out and will use federal tuition assistance to off-set the cost of their education while on active duty. My sacrifices were worth the benefit I received in return. However, I would not advocate that someone join the military solely on the premise of receiving GI bill benefits. We are a voluntary fighting force and there’s always the chance you could die before utilizing your benefits. You must go in with an understanding of this very real risk and think critically about the benefits and consequences associated with military service. When I served outside of Ramadi in late 2004 to early 2005, I was at a base that was frequently hit with mortars. On February 2, 2005, one of my officers was a casualty of one such mortar. He left behind a wife and he never had the chance to bring children, if he desired them, into this world. He also did not fulfill his desire to continue his education. In other ways, his service protects the freedom of others and leaves behind benefits for his wife. I try to remember to enjoy my privilege because I fought for our country and I was fortunate to come home. It would be a shame to waste my entitlement and let the 15 year entitlement period exhaust without using a dime of that money. So, am I nervous to share what money I received? Yes. There will probably be some flack from the non-privileged, to include veterans who did not get out honorably so they are not entitled to these benefits. But I am happy to share with the world that I am working to make full use of a benefit I earned. I’m probably barely scratching the surface of what’s out there, but I am becoming more educated about the civilian partnerships out there to care for the needs of returning veterans. I am truly honored to see so many people who care about the wellbeing of our combat veterans in such a giving way. Please share this information with anyone you know who could benefit.